This course is for beginners wanting to become active crew members. You will experience living on board and really get to know the boat. Virtually all the course is hands on. You are the crew - without you the sails won't go up and the boat won't be steered. By the end of the course you should be able to steer, handle sails, keep a lookout, row a dinghy and assist in all the day to day duties on board. You will also have visited some very interesting places and had a very enjoyable holiday. 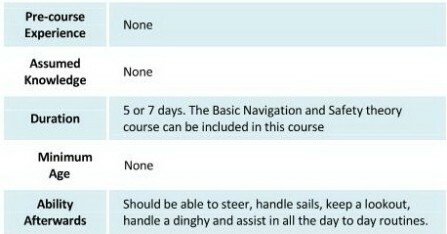 A useful addition to this course is the RYA's Essential Navigation and Seamanship theory course, which can be combined with the Competent Crew course to make an excellent introduction to both the practical and theoretical aspects of yacht cruising.